And yet, despite this knowledge, alternative population scenarios are rarely considered in climate assessments. “We do know that things like fertility and population growth can be responsive to policy and programmatic interventions,” she says, and more than 233 million women worldwide currently lack access to family planning but want to delay or prevent pregnancy. Addressing that unmet need could make a major difference in the growth rates of many regions of the world, reducing climate vulnerability along the way. Mogelgaard outlines four ways the links between climate change adaptation and reproductive health strategies need to be strengthened: in adaptation planning frameworks, tools and training, program design, and the evidence base for these connections. The creation of National Adaptation Programs of Action (NAPAs) was a major initiative by the UN Framework on Convention on Climate Change to create climate adaptation plans for the most vulnerable countries. Most of the plans, in fact, identified rapid population growth as something that exacerbates vulnerability. But when it came to the implementation phase, only a “handful of the NAPAs recognized that family planning and reproductive health services could be part of an adaptation strategy,” Mogelgaard says; fewer still made them a priority, and none were funded. This was a missed opportunity, she says, but there is hope that the NAPA successors – the National Adaptation Plans – may be able to better incorporate reproductive health needs. In terms of program design, she says one promising approach is the population, health, and environment (PHE) model of development, which integrates community-based approaches to challenges related to population dynamics, access to health services, and environmental degradation. 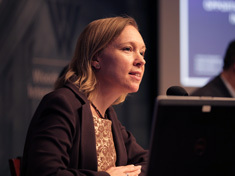 Kathleen Mogelgaard spoke at the Wilson Center on March 11.